You’ve probably seen the videos of Tiger Woods as a kid striping the ball and thought ‘why can’t I do that now?’. His good foundation for golf started at a very young age and continued to build on it. Many golfers start the game at an older age and it is tough to train that natural ability when it hasn’t been polished from the start. If you have kids, giving them an opportunity to be great in anything usually starts with an interest and grows into a love for it. Golf can be addicting and one of the best games to teach all of life’s lessons. 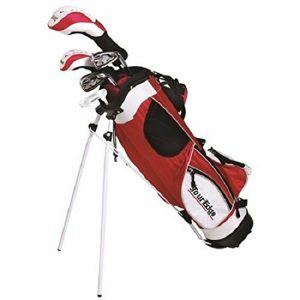 If your son or daughter has a passion for the game or just looking to take up a new sport, the first step is selecting the best junior club set that enables them to enjoy the game. Something that does not look good or fit properly gives less of chance for enjoyment out on the course. The first goal at a young age is to always have fun and then to develop as a player. No one wants to work at something that isn’t fun! The first step in choosing the best junior set is to ensure you get the right length of club for your child. Club fitters will measure the child’s height and fit accordingly, but if that is unavailable they make certain sets for different age groups that can fit pretty close to perfect. If a child uses an adult length club, the club head won’t sit on the ground properly and makes good contact with the ball next to impossible. Having the correct length will also allow for a swing that creates speed and good timing. The weight of the club is important for junior players. The most common mistake is having a club that is too heavy, the child will have a tough time swinging the club and ball contact will suffer as a result. Timing is a big key for young players because they like to “grip and rip” (which is good). Younger players tend to take less time and naturally hit at the ball, but if a club is too heavy it can slow down the natural rhythm and be frustrating for a beginner. Simply cutting down the length to take off weight from the shaft of an adult club will not do, because the head weight is made with an adult length shaft in mind and will be affected as well. The next consideration is the flex or stiffness of the club shaft. You might think that saving your old clubs and cutting them down to save cost would be a great idea for your young players. That is far from the truth. The club may look like it fits them but it does not. Cutting a club down, especially from the tip end more than an inch can increase the stiffness dramatically. If a young player plays with a club that’s too stiff, it can be maddening when they may have a good swing but the ball is not getting airborne. If a junior is just starting the game, it’s unlikely that they will require a full set of 14 clubs. 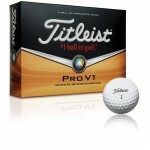 Generally, a driver or lofted wood, an iron or two, and a putter will suffice when learning the game. A lot of young players will build confidence if they learn to trust their limited set. It can also teach a new golfer to become creative if they don’t have the “right” club for the shot. An example of this would be in the short game area; players that are forced to see different shots with the same club can create feel and touch. If the player is starting to play in junior tournaments, it’s more likely that they will need a full set of wedges and a variety of irons when distance control starts to become more crucial. The beginner category speaks for itself, and is for the junior player just taking their first steps into the life-long addiction called golf. Intermediate players are junior players who have been playing for some time and may be looking to enter some tournaments, whilst the transition category covers those junior players who are playing tournaments and starting to get more serious about the game. 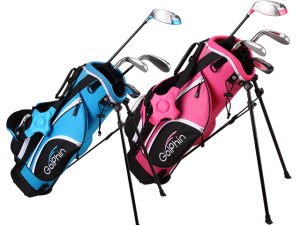 Constructed with ultralight aerospace-alloy aluminum, Golphin introduces golf to kids through a fun-looking set that features four clubs. The bag includes a driver, mid-iron, short-iron and putter which all have a sweet spot 35% larger than average sets for added forgiveness. This set is designed for a child height of 48”-52.5” tall. This is typically between the ages 6-9 years old. It comes in pink and blue sets for both right and left-handed kids. A very simple beginning set for kids around the ages of 4-7. The four club set comes with a lofted 3-wood, 7 and 9-irons, and a mallet putter. The junior flex graphite shafts are easy to hit with their larger-sized heads. 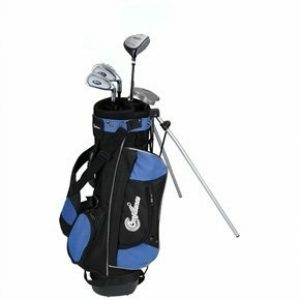 The set includes a stand bag that will hold all of the essentials. Introducing the game of golf with this five-club set will be enjoyable. This easy-to-hit set includes an oversized Matrix Alloy driver, a lofted hybrid, two oversized irons (very wide), and an easily aligned mallet putter. All of these tweaks in the design give maximum forgiveness to build confidence of a young, beginning player. The US Kids Ultralight is exactly that – ultra light! The set has five clubs including a driver, three irons and a mallet putter. The “ultralight” feel allows a younger player to swing a club how it should be, with speed! 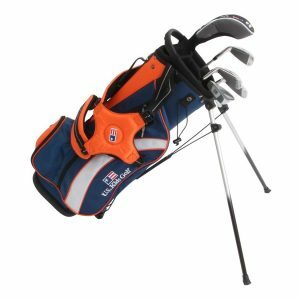 Not only a great product, the best feature of the US Kids brand is the fact that you can exchange old clubs for credit, which means that when a growth spurt happens, you don’t have to throw the clubs out with the trash. Your kid will love you and so will your bank manager. Tour Edge delivers a five-club set for kids between the heights of 52” to 60” tall. All of the shafts have low kick-points to assist in getting the ball airborne and carrying farther. 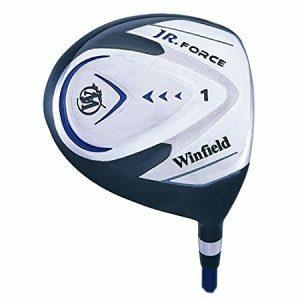 There is a driver which has 15-degrees of loft, the hybrid has 29-degrees, a 7/8 iron for mid-range shots, and a 9/PW for short-range shots and short game. The stainless-steel woods, hybrids and irons are ideal for performance and getting adjusted to a set that requires feel and touch. 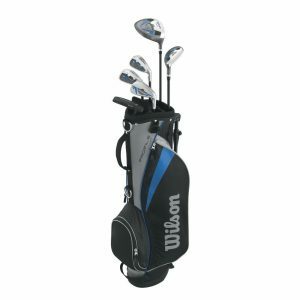 Wilson includes six clubs with graphite shafts to boost the young player’s game. A driver, hybrid, two cavity-back irons, blade style wedge and a blade-style putter make up the whole set. The intermediate player will start to appreciate a wedge in the bag for short game along with a driver that can send the ball a long way. The set is ideal for kids around 9-12 but it comes in different sizes with their blue=large, yellow=medium, and red=small sizing to accommodate a younger player that is more advanced than others. Ping Thrive is the set for the junior player who wants more, featuring 10 clubs and a bag that includes a driver, a fairway wood, hybrid, 6-PW irons, a SW, and an Anser-style putter. The set is the closest thing to an adult set without actually being one. With graphite shafts to help increase clubhead speed, the ball will be easier to get in the air. Ping designs their clubs with forgiveness in mind and these are no different. 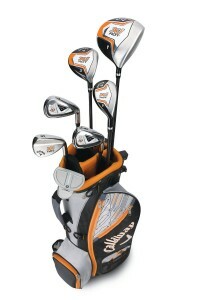 Callaway has offered great products for adults and are now putting the same technology to use with their junior sets. 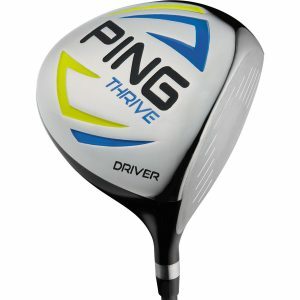 A 360 cc driver is lightweight and has a lot of forgiveness off the tee. 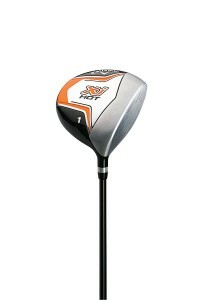 It is complemented with the fairway wood and 5-hybrid which allow the ball to rise quicker and more effectively. There are three irons including a 7-iron, 9-iron and sandwedge. To finish out the set they include an Odyssey 2-ball mallet-style putter which is great for teaching a young player to align the clubhead square to the ball. Bag is included in this great set. Tour Edge has created a very logical full set for players looking to get serious about the game. 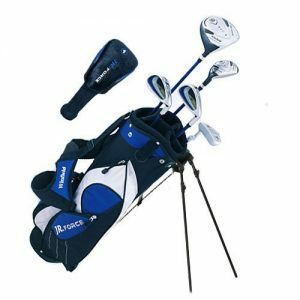 The set holds 11 clubs including a driver, fairway wood, hybrid, oversized stainless-steel irons and a blade style putter. The set differs from most beginning sets because it has graphite shafts for the woods and hybrids and steel shafts for the irons and putter (like most adult sets). The oversized irons still give maximum forgiveness for a younger player’s skill level but adjusts them to the feel of steel shafts. 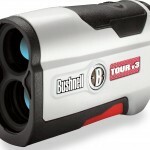 A great set for tournament play because it offers options when out on the course for different distances.